Linfield students Garrick Rozairo '12, Lauren Funtanilla '11, Tyler Huynh '11, Lindsay Gehres '12, Amanda Holtby '11, Arielle Perkins '11, Jasmine Arrusamy '11, Stephen Guttridge '11, Aaron Cody '10, Megan Taylor '11, and Colleen Williams '11 celebrate reading at Nicholson Library during the summer of 2010. 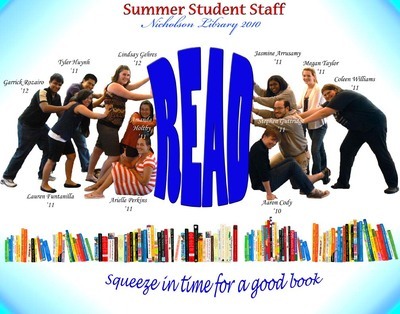 Terry, Paula and Nicholson Library Staff, "2010 Summer Student Staff READ Poster" (2010). READ Poster Gallery. Image. Submission 81.